More key Apple employees are leaving to work on cars. Tesla keeps luring away essential Apple staff amidst rumors that the company’s own car project has stalled. Tesla announced this week that Chris Lattner, creator of Apple’s Swift programming language, will join the car maker as vice president of Autopilot software for its self-driving car project. According to 9to5Mac, Lattner isn’t the only recent defection from Apple. Matt Casebolt, who worked on Macs as a senior director of product design, became Tesla’s senior director of engineering for closures and mechanisms last month. And those are just two of the most recent departures. Tesla has been snatching up Apple employees left and right, making Tesla’s campus seem like a veritable Apple class reunion these days. Tesla’s senior director of communications, senior director of reliablity, global creative director, vice president of materials, and more of its engineering leadership all have Apple roots. To be fair, the hundreds of Apple employees that Tesla has lured away are a small percentage of Apple’s 100,000+ workforce. But the type of hires—high-profile and seemingly essential to Apple—that Tesla is making these days is significant. It seems the rumored upheaval in Apple’s Project Titan self-driving car project team, which has reportedly pivoted to autonomous car software development from hardware, has been a boon for Tesla. Back in October, Bloomberg reported that hundreds of Apple employees working on the car project were either laid off or quit after the pivot. Elon Musk famously called Apple a “Tesla graveyard” for employees that didn’t do well at the car company. “If you don’t make it at Tesla, you go work at Apple,” Musk told a German newspaper in 2015. 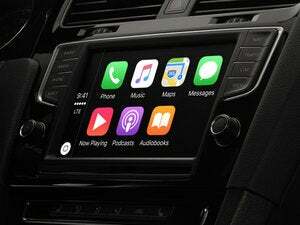 Apple will reportedly decide the future of its car project later this year.